Here are some snaps of just one of the projects completed last week at City Handyman. 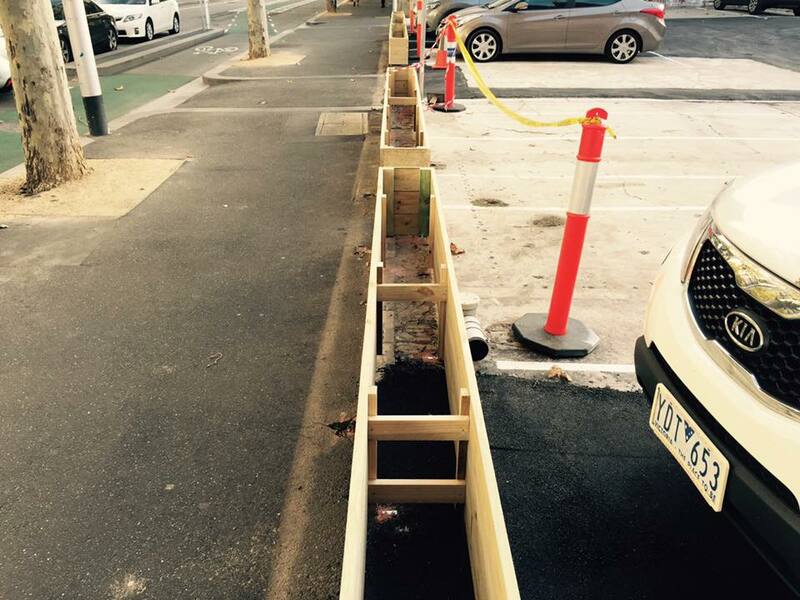 The works involved custom building 16 planter boxes for a new Melbourne CBD car parking facility on La Trobe St. The boxes pictured were to be filled with hardy potted grasses and mulch. Simple and effective creation of greenery in a relatively hard landscape. Listed below are other projects and jobs completed throughout the week. 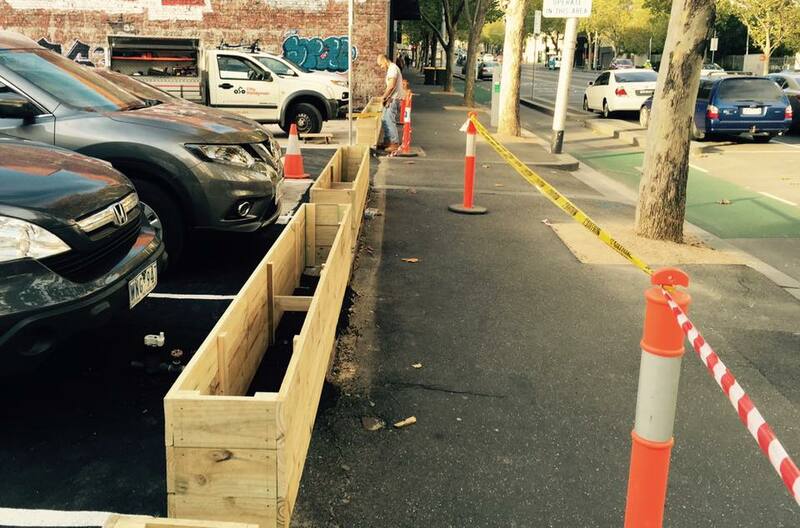 Melbourne CBD – Completion of installation of planter boxes to a new CBD car-parking facility (featured above). 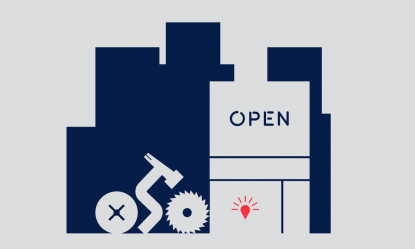 Melbourne CBD – Consult on mixed repairs to a restaurant. Collingwood – Rehang a meeting room door in library. Adjust towel rail in ladies bathroom. East Melbourne – Adjustment of a window lock. Tighten 2 x taps. Replace globes. Caulking to sink in the kitchen. Melbourne CBD – Two man handyman work moving furniture around an office space. Cremorne – Mount a first aid cabinet onto the wall and other mixed handyman work as directed by client. Melbourne CBD – Site visit to check and advise on workstation issues/repairs. South Melbourne – Consult to advise on improvements to dishwasher installations on all floors of a commercial building. 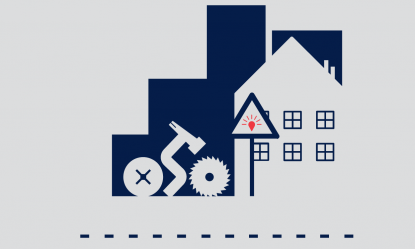 Melbourne CBD – Mixed handyman works around the office. Melbourne CBD – Consult to provide advice. Port Melbourne – Patch as required and paint multiple walls around an office to facilitate tenant moving from one space to another. Hang pictures as directed. Melbourne CBD – Workstation adjustment and hang a large picture. Melbourne CBD – Mount a TV using client supplied bracket, hang a clock and 1 x painting. Mount melamine shelves. Patch holes in the ceiling and paint using colour matched paint. St Kilda – Assembly of an ikea day bed. Hawthorn – Patch and paint work. Supply and fit a rangehood. Exterior door rejuvenation and repairs. Skirting board replacement. Water damage repairs. Table repair. Painting of window frames. Melbourne – Patch and paint of peeling areas and refit a skirting board. Apply colour matched interior paint to the repaired areas. Melbourne – Hang 8 x pictures and relocate 1 x large picture. Abbotsford – Repairs to 3 x internal doors. St Kilda – Installation of blinds and removal of existing curtains to a master bedroom. Melbourne CBD – Mount a headboard and round mirror. Hang 2 x pictures. South Yarra – Collection of 3 x flat packed over bonnet storage units from freight company and assemble and install into apartment car parking spaces. Kew East – Construction of garden beds. St Kilda East – Consult to discuss decking options. Collingwood – Repairs to sliding door and front gate. Mount a TV on the wall. Melbourne CBD – Door lock and blind repair. St Kilda East – Regular caretaking and gardening. Caulfield South – Sliding door repair. Brighton East – Lawn mowing and garden tidy up pre-leasing. Carlton – Replace front door handle. Southbank – Repair door frame and paint using colour matched paint. Southbank – Reinstate a door stop. Repaint a skirting board. Adhere lifting wall paper. Install a shelf. Re-fit fridge door handle and 2 x bedroom cupboard hinges. 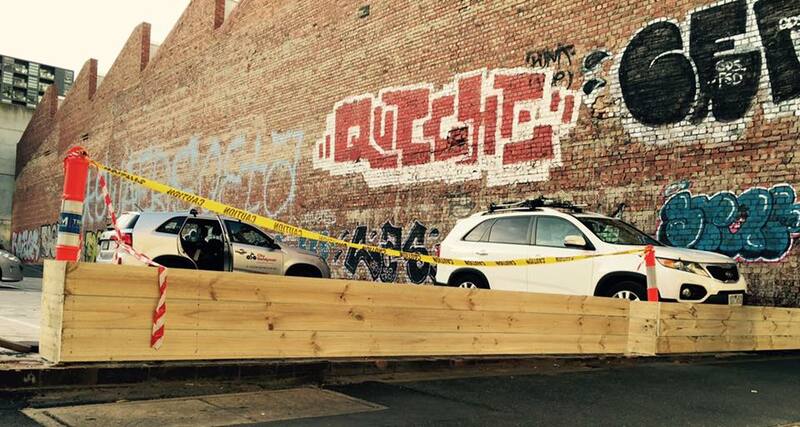 Elsternwick – Consult on options of new picket fence installation or repairs. Melbourne CBD – Blind re-fit. Melbourne CBD – Bed frame repair. East Melbourne – Paint bathroom ceiling and replace a cabinet. South Melbourne – Supply and install a weather strip. Carlton – Patch damaged areas over two lounge room walls and paint over using colour matched paint. South Yarra – Re-install integrated dishwasher front panel and service hinges.